My friend Chris forwarded me a news story about a DVD vending machine being installed in the library in Strongsville, Ohio - but instead of a RedBox, it vends the library's DVDs. Some libraries do have a RedBox, but that approach never sat well with me - it seemed like an uncomfortable competitive fit. But an easy-access vending machine that distributes library materials? Great. This is the first of two machines they purchased, with an LSTA grant from the State of Ohio intended to explore ways to meet the needs of underserved patrons. These machines are ideal for serving patrons where a library branch can't be built. The second machine will be installed in a local hospital, serving as another 24x7 library location. Similarly, a library in Iowa is considering installing one in the headquarters of a large local business - another nice example of bringing the library to the patrons (although it also sounds like something you'd find in the Googleplex). These vending machines serve other uses too - after conducting a patron survey on how to deal with DVD theft, the Arapahoe Library District in Colorado in the process of installing installed them to help protect their collection. And other libraries have been using vending machines for awhile. In Connecticut, the Oliver Wolcott Library has had one since 2010. 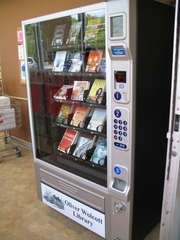 However, my favorite is what the Ottawa Public Library is doing - putting vending machines at their commuter rail stations and community centers (via). In the age of downloadable ebooks and streaming video, using vending machines to distribute physical library materials might already seem outdated. But don't forget, public libraries serve a spectrum of patrons, all with different interests and needs. After all, despite the popularity of smartphones, our public fax machine is used just about every day (our microfilm machine and typewriter aren't exactly idle, either). Anything we can do to make library services available outside the library's building and operating hours - in a variety of ways to meet a variety of patron needs - is a good thing.